If you need several-stages crushing, you will need screening equipment which is responsible for separating different-sizes materials and conveying them back into relevant crushers through belt conveyor. SBM will provide you with vibrating screen equipment which is ideal for quarries or recycle operations in portable or fixed mounting. 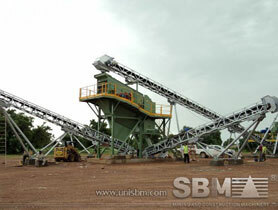 To feed crusher, you can choose our vibrating feeder which is installed before jaw crusher. The vibrating feeder moves the material continuously, so it can be effectively separated and fed evenly into the jaw crusher. Plus belt conveyor, all the assistant equipment help delivers high capacity and efficient working flow. You are most welcome to chat with our online support for more services. SBM cobble stone grinding machine is used in sand and powder making plant. Cobblestones were largely replaced by quarried granite setts in the nineteenth century. Cobblestone roads are a decisive element in some of the biggest professional cycling races. "SBM cobble stone screen, grinding equipment makes excellent capability and simplify the process flow in the coarse crushing line."